The Lost Child is Frankenstein’s dungeon-crawler. Mad scientist Takeyasu Sawaki laid his pet project, El Shaddai: Ascension of the Metatron, on a slab. He attached disparate, rotting parts, raised the slab to the sky and brought that ish to life with a bolt of lightning. It’s hard to even evaluate The Lost Child as the sum of its parts, as everything feels bolted on like so many parts of an undead, godless monster. That said, these parts somehow work together to create an experience that can and will appeal to a specific set of interests. The Lost Child plays like a bullet-point list of low-budget Japanese RPG trappings, and some El Shaddai characters are in it too. It’s a spin-off, probably? It’s not important. The Lost Child puts players in the shoes of Hayato, a Shibuya-based journalist who wears a fancy coat and works for a local occult rag as the only employee. His boss sends him all over the place chasing paranormal leads, the latest being a string of suicides at the train station. Investigating leads to a set of events involving angels (both the normal and fallen kind), demons, Lovecraftian (literally) horrors, and a celestial Pokemon gun. Much like darn near every non-AAA title living in the niche world of anime-loving dorks like myself, The Lost Child looks and feels like a visual novel upfront. Well drawn but sparsely animated character portraits take up the middle of the screen, and the entire lower third is generally a text box. You see the world through Hayato’s eyes, and make dialogue choices quite often (more on that later). In true visual novel fashion, Hayato meets a mysterious woman, gets swept up in all sorts of impossible nonsense, and then hardly reacts at all! With all the jargon and Heaven/Hell gobbledygook being thrown around, Hayato is meant to be the audience surrogate, the straight man that keeps all the biblical wackiness manageable. But we seldom hear from Hayato, save for when it’s time to make a silly dialogue choice. We don’t get his inner thoughts, and really only hear from him when it’s time to introduce a new element of the world, through light narration. Otherwise it’s mostly the Lua, the leading lady, who does all the talking. And considering her involvement in everything going down, she doesn’t really do anything for an oddly missing human element. 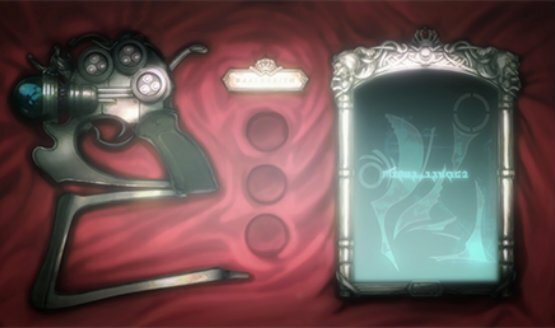 Visual novels work because the player gets inside the head of the narrator. Otherwise, it’s hard to relate to the story and care about what’s happening. 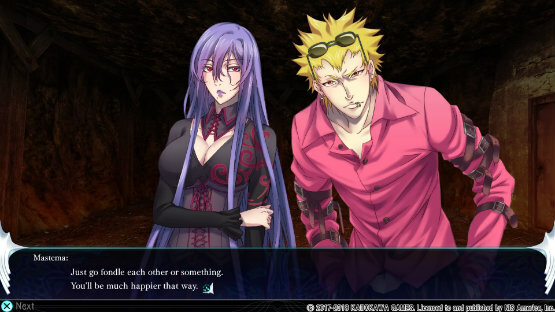 The Lost Child is as much a first-person dungeon-crawler as it is a visual novel. When you’re not advancing the story in dialogue scenes, you’re spelunking in Layers, and fighting demons. In the Layers, or dungeons, the game’s low production values really start to stand out. The environments are really bland, plagued by low detail, low visibility, and low creativity. It almost looks like a high-res PlayStation 2 game, behind all the high-res character art. The music is fine but nothing memorable, and the solitary stepping sound effect will haunt your dreams. This is a game that does not benefit from being blown up onto a large TV screen by a modern console. Navigating through the dungeons doesn’t bring much surprising to the table. You make your way through each dungeon’s gimmick obstacles, and find the next set of stairs. Sometimes there’s a puzzle, and sometimes there’s a switch to a locked door—within eyesight of the locked door. One nice perk is an autopilot function, which lets you pick a spot on the map and have the game take you there by itself, only bringing you back if combat triggers. And combat is where all the magic happens. Okay, so it’s a visual novel. It’s a dungeon-crawler. But guess what: it’s also a monster-catching game. And while it’s fun to joke about Pokemon, the systems here feel more like a blend between Shin Megami Tensei and Puzzle X Dragon, with a splash of SaGa just to make things more grindy and complicated. Buckle in everyone, it’s time to get real nerdy. A monster-catching game is only as good as its sense of progression, and this is where The Lost Child really shines. It takes the core appeal of both traditional and mobile-style games of the genre, smashes them together, and finds a happy medium I feel like I’ve only scratched the surface of in the best kind of way. Hayato is just a normal dude, and in combat he uses whatever he can find, from a camera tripod to guns and swords he finds while exploring. But he also has a secret weapon from Heaven called the Gangour, which if fired at demons can capture and “purify” them, bringing them over to fight on the good guy team. The success of a capture is based on the damage you do with a shot, which is altered by a “Burst” gauge. The thing about that is it can overload, starting you back at square one in terms of damage. So while you may be concerned about taking out that demon you haven’t captured yet, you also have to worry about timing your Burst meter to make sure you do optimum damage. Once you capture and purify a demon, you have to pump karma into it to make it stronger. While Hayato and Lua level up like normal through EXP, demons only grow by feeding them karma points. You get karma points through battle, sure, but you also earn it through your dialogue choices. And certain demons prefer one of three types of karma, which impacts how much karma it takes to level up. This is where the mobile/Puzzles X Dragon comparison kicks in. Raising your growing stable of demons is all about leveling up through resource management. But wait, there’s more! Demons hit a level cap eventually, and you can take them to the “Cyber Priest” to evolve them to a new form and raise them further. This costs a certain item that is generally hard to come by, adding another layer of nuance to raising your team. Finally, while your critters grow stronger this way, they don’t earn new skills from leveling up. Instead, they earn them randomly in battle, much like various systems in the SaGa series. Thus, you’re encouraged to actively use demons you’re interested in, in order to get the most out of them. That’s a lot, but it’s a big loop of progression that helps the player always feel like they’re accomplishing something. No matter what demons are in your active party, you’re earning karma that you can feed into whatever’s in your overall collection. The active demons in your party are earning skills, and you’re always hunting for items needed for evolution (during and after you’re doing the whole “finishing the story” thing). It’s a deadly mixture for fans of monster-catching games. You get the rush of evolving forms, the ease of resource-based grinding (without the mobile pitfalls of stamina and microtransactions), and of course the satisfaction of building a powerful team that wreaks havoc because you got lost in the grinding and forgot to actually finish the dungeon you were on. The Lost Child is like that car your friend really likes but is hideous to look at. It’s made of different parts, some of them from a different kind of car entirely. It makes funny sounds, and the sound system is a disaster. But they’ve had that car for years, and it still somehow runs without any problems. This visual novel/dungeon-crawler/monster-catcher is a whole lot of stuff mashed together, sometimes to awkward results. But the real meat and potatoes, the monster-catching, is not only the glue that holds The Lost Child together, but it’s also a big ol’ can of elbow grease that pushes the whole package forward. It’s not always fun to read or look at, but I can get lost in grinding, evolving, and purifying more demons for hours. Game Title review code provided by publisher. Version 1.01 reviewed on a PlayStation 4. For more information on scoring please see our Review Policy here.